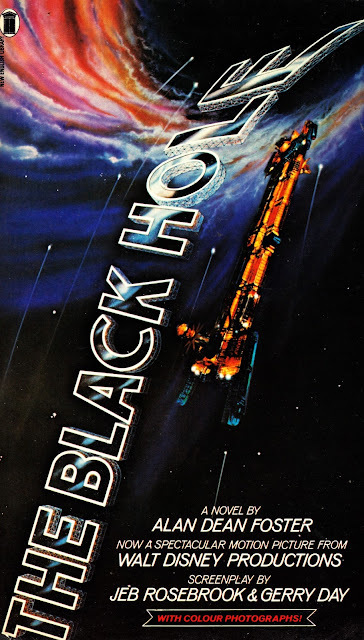 From 1979: THE BLACK HOLE movie novelization. There were certain books that were essential items in any Star Warrior's library during the peak of the Star Age... and this was one of them. The ubiquitous Alan Dean Foster supplied the words and the deal was sweetened by the obligatory insertion of a selection of colour stills in the middle. The publisher was clearly so confident that this one would fly off the shelves with minimal effort that they didn't even bother with the usual back cover blurb. The publisher (NEL?) also produced a concurrent "junior novelisation" (featuring Foster's text edited down by about one-third), which was another sign of confidence in the property. I love The Black Hole. 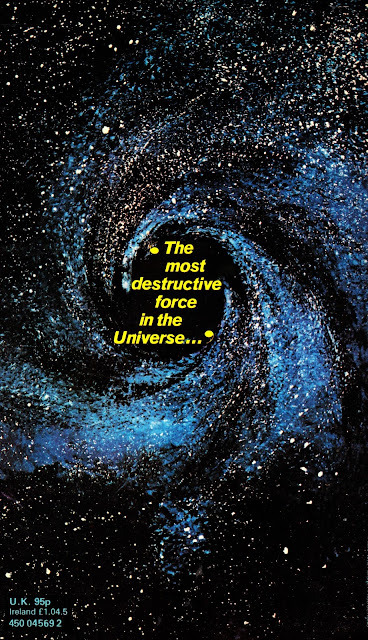 It's unfairly dismissed as a Star Wars wannabe when it really had a great feel all its own. It's essentially a haunted house/creepy mansion horror movie, with the Cygnus as the house. That makes two of us krusty ! Its still hugely under-rated and if I recall correctly, the super freaky ending in the movie is barely alluded to in the novelisation. Instead there is some vague reference to being stretched to infinity.... I can only assume that Alan dean foster was never told about the actual ending and had to make up his own. It was a closely guarded secret by Disney at the time. I agree wholeheartedly... it's an excellent movie that seems to have an unfair reputation. The production design is just stunning. If I recall correctly (and I'm not sure where I recall it from), they started shooting the movie (ala ST TMP) without much of a clue as to how they were going to finish it. So the ending was a closely-guarded secret in the "it doesn't exist yet" sense. The comic book adaptation is also suitably vague, although this might be down to a reluctance in portraying hell and various other biblical bits-and-bobs in a kiddie comic. The comic book (which didn't last long) then went on to run a couple of issues of post-movie adventures. It turns out they crossed through to a "mirror universe" which was the same... but different. At the time I thought this was amazing... the strips were reprinted in the one-and-only British annual. Confession time: I saw this in the cinema when it was released and I was so into it that the spinning effects at the climax made me dizzy. I can still remember the sensation as we left the cinema afterwards.